How does life work? How does nature produce the right numbers of zebras and lions on the African savanna, or fish in the ocean? How do our bodies produce the right numbers of cells in our organs and bloodstream? In The Serengeti Rules, award-winning biologist and author Sean Carroll tells the stories of the pioneering scientists who sought the answers to such simple yet profoundly important questions, and shows how their discoveries matter for our health and the health of the planet we depend upon.One of the most important revelations about the natural world is that everything is regulated—there are rules that regulate the amount of every molecule in our bodies and rules that govern the numbers of every animal and plant in the wild. And the most surprising revelation about the rules that regulate life at such different scales is that they are remarkably similar—there is a common underlying logic of life. 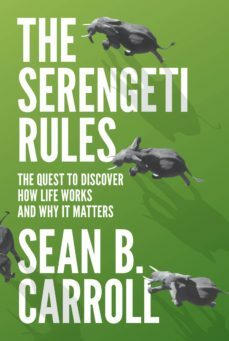 Carroll recounts how our deep knowledge of the rules and logic of the human body has spurred the advent of revolutionary life-saving medicines, and makes the compelling case that it is now time to use the Serengeti Rules to heal our ailing planet.A bold and inspiring synthesis by one of our most accomplished biologists and gifted storytellers, The Serengeti Rules is the first book to illuminate how life works at vastly different scales. Read it and you will never look at the world the same way again.